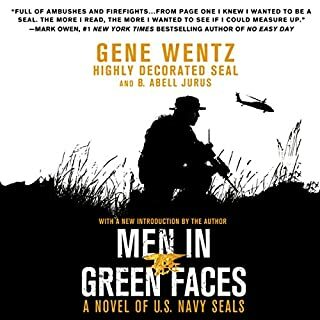 Fearless takes you deep into SEAL Team SIX and straight to the heart of one of its most legendary operators. Long before Adam Brown became a member of the elite SEAL Team SIX - the counterterrorism unit that took down Osama bin Laden - he was a fun-loving country boy from Hot Springs, Arkansas, whose greatest goal had been to wear his high school’s football jersey. An undersized daredevil, prone to jumping off roofs into trees and off bridges into lakes, Adam was a kid who broke his own bones but would never break a promise to his parents. But after high school, Adam fell in with the wrong crowd, and his family watched as his appetite for risk dragged him into a downward spiral that eventually landed him in jail. 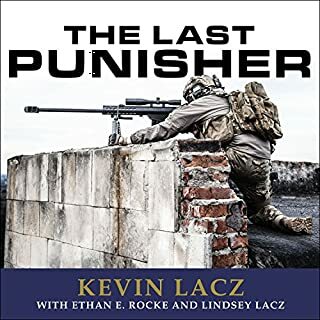 Battling his inner demons on a last-chance road to redemption, Adam had one goal: to become the best of the best - a US Navy SEAL. An absorbing chronicle of heroism and humanity, Fearless presents an indelible portrait of a highly trained warrior who would enter a village with weapons in hand to hunt terrorists, only to come back the next day with an armload of shoes and meals for local children. 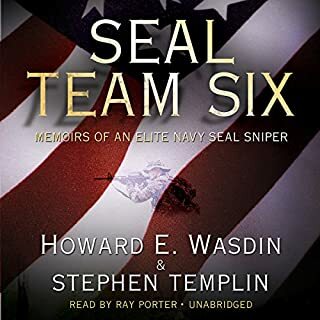 It is a deeply personal, revealing glimpse inside the SEAL Team SIX brotherhood that also shows how these elite operators live out the rest of their lives, away from danger, as husbands, fathers and friends. Fearless is the story of a man of extremes, whose courage and determination was fueled by faith, family, and the love of a woman. 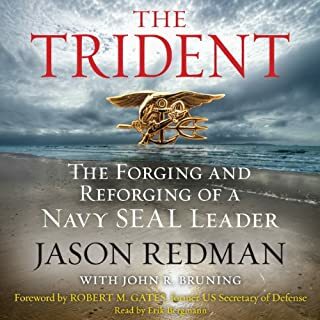 It’s about a man who waged a war against his own worst impulses and persevered to reach the top tier of the US military. Always the first to volunteer for the most dangerous assignments, Adam’s final act of bravery led to the ultimate sacrifice. ©2012 eChristian Inc. (P)2012 eChristian Inc.
We listened during car rides this summer and the whole family loved it! Such a powerful and inspiring story. 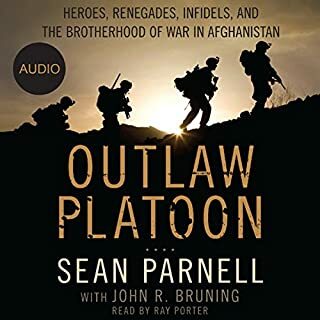 I didn't know going into this book what to expect, but I devoured it faster than any other book I've listened to. I was blown away by this story. Adam was an incredible person and overcame overwhelming odds to achieve what he did. I think the book was done in a very tasteful way without imparting and politics or opinions about anything. It just laid out the facts about who he was and what he did - the person he was. The way he lived his life is an inspiration and is a reminder to me of how much better we can all be. It's easy to get caught up in the small things, so if you need a little perspective and motivation, Adam's story is just that. Learning about the various elements that made Adam Brown a hero touched a deep part of my being. 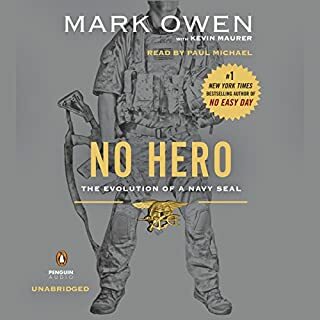 This biography was expertly written and I would highly recommend it for anyone interested in exploring the humanity of one hero's life journey. you'll get lost in this book. set aside some time for this one. you'll learn about a drug addict, an american, a hero. this book reminded me of all my short-comings and failures, and urges me to shoot as high as i can. This review is more about the book's critics than the story itself, which is remarkable and speaks for itself. First, I am neither spiritual nor religious, not at all. However, this does not stop me from empathizing with those who are. That fact that this Christianity was a driving factor in Adam Brown's life is noteworthy, whether you share his beliefs or not. I am amazed at some of the reviewers who tear down this story because of the religious aspect, because these are probably some of the same people who lecture others about tolerance of other races or sexuality. Yet they can not tolerate others who happen to be spiritual. I was asked by my cousin from Hot Springs to read this story. 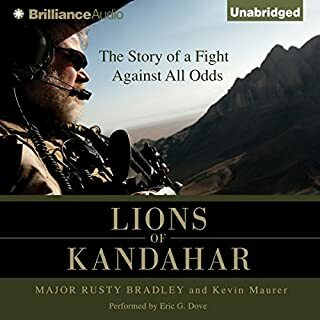 I bought it immediately on Audible and started listening that evening and couldn't stop listening. 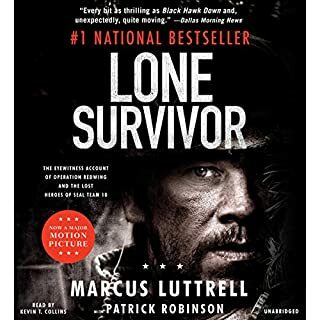 Remarkable true story about a young man who went through one hell of a life to make him become who he was with the help of God behind him all the way. He became a man, hero, true warrior, and Fearless. A friend to all and loved, respected, trusted and we have the privelege to read about him in this book. Insight into his family and how they were there for him always was written well, I felt like I was there. Listened while driving and had to pull over a few times. Recommend this book highly. The most fantastic biography I've read! 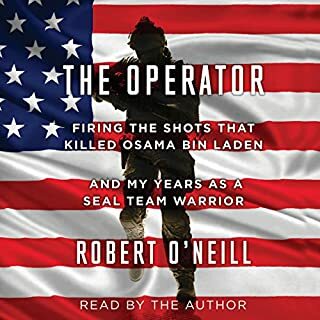 This is a biography of a young man whose life was dedicated to the USA, and all that it stands for. His remarkable life, with its downs and ups, are a testament to faith in a loving God! STUNNING! A life lived with courage and love! What made the experience of listening to Fearless the most enjoyable? The story! 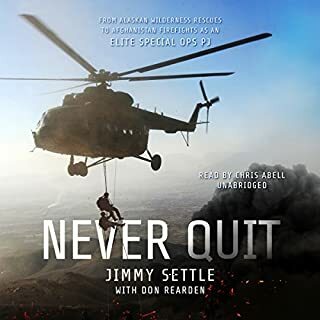 The fall, rise and struggle of Adam Brown against STAGGERING odds shows a man who went out a winner, patriot(and that is a title you have to EARN) and hero to anyone who has ever fallen but never quit getting back up! What other book might you compare Fearless to and why? The Last Lion by William Manchester on the life of Sir Winston Churchill. Churchill had many failures in life but none personally more painful to him than his Gallipoli Campaign during WWI when he headed the Admiralty. 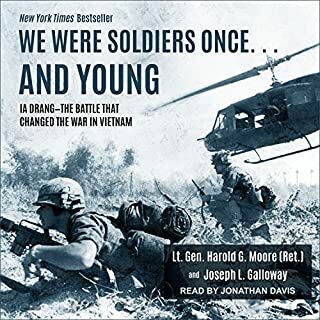 After the crushing, costly defeat, which many thought would end his career he resolved that if he could not end the war he would shoulder a rifle and serve with the soldiers he had tried to save. So he went to Flanders with a Scottish Brigade and saw action. 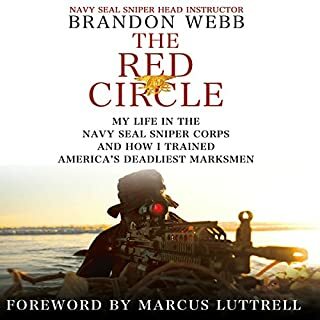 That was the character of the man and his resolve to "never ever quit" makes me think of the Seals. Smooth, easy to the ear but his "women and kids" voice is the same and a little silly. I had a stepbrother who struggled with serious drug and alcohol addictions his entire adult life only sobering up literally the last 5 years. The young adult life of Adam Brown is a painful story repeated everywhere but doesn't have the sad and tragic ending of most addicts. We all end, You have no say when you go and usually not how, You only chose how you live. Adam Brown's life is a life of guts and heart that moved me deeply. 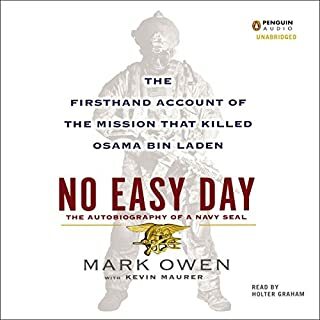 I listened to the audible of Mark Owens and Kevin Maurer's "No Easy Day: The Firsthand Account of the Mission that Killed Osama bin Laden" (2012) shortly after it came out. 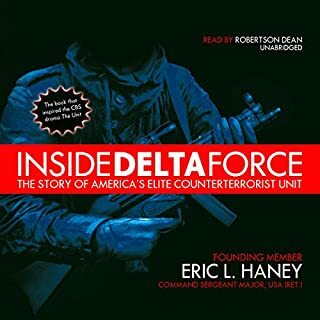 I liked the book well enough to rate it 5's - it was really great to hear about that mission from someone who was there. I went back and reread my review (which was lackluster and not well received) and realized what I wasn't saying in that review was that I didn't like 'Mark Owens' and I thought it was a "me, me, me" story. There had to be more to being a SEAL than that - and this is the book that shows there is. 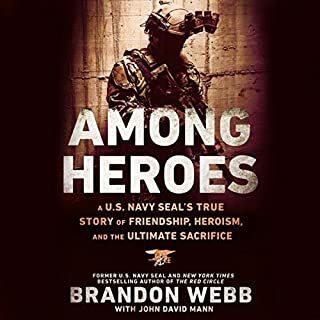 "Fearless: The Undaunted Courage and Ultimate Sacrifice of Navy SEAL Team SIX Operator Adam Brown" (2012) is the story of a flawed, heroic man who was genuinely admirable and truly loved. I'm not sure 'Mark Owens' has a conscience. I am certain Adam did. Adam was the kind of kid who stood up to a bully in middle school who was picking on Down Syndrome kid, and packed his rucksack with shoes for children in Afghanistan so they wouldn't have to endure winter barefoot. No one told him he had to do either - he was just that kind of person. Adam wasn't always heroic. He was a crack addict with 11 felony arrests, spent a long stint in rehab, and relapsed several times. 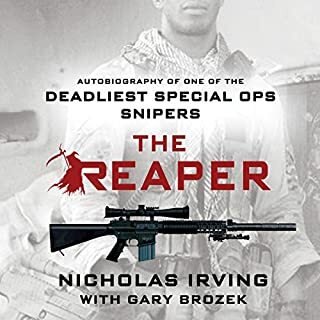 He enlisted in the Navy at 24, and worked with determination to ascend to DEVGRU, and was the best of the best. Adam overcame severe injuries that could have let him retire on full disability - he crushed his right fingers and lost his right eye, but he still passed all of the qualifications tests and reached the pinnacle of his profession. 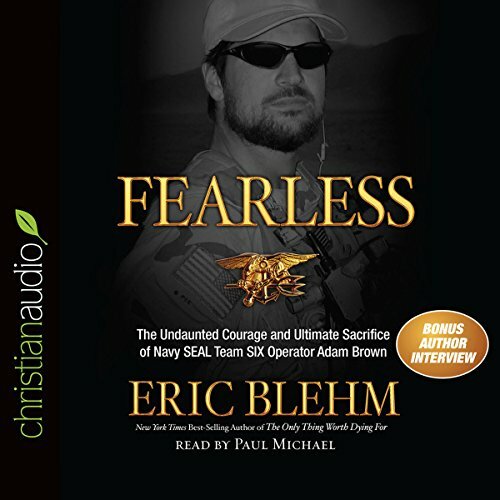 "Fearless" was published by The Doubleday Religious Publishing Group, and the audio production is by Christian Audio. I was worried that this was going to be a preachy "you should" book, or a tale of unsupported faith. I almost didn't listen - but I remembered that Laura Hillenbrand's "Unbroken: A World War II Story of Survival, Resilience and Redemption" (2010) had an important spiritual element for Louis Zamperini. Adam Brown's faith, and his family's faith, love and support were even more essential to him than his M4 Carbine. 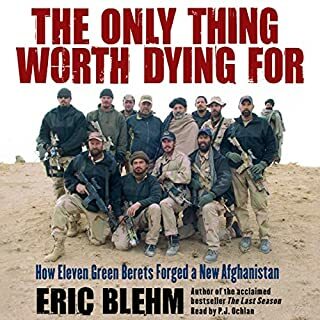 Even though I knew how Adam's story ended - author Eric Blehm tells of Adam's death at the beginning - I so wanted Adam to live for his beloved wife, Kelley, and adored children, Nathan and Savannah. Listening to narrator Paul Michael was like listening to a favorite uncle telling a well-loved family story after Thanksgiving dinner. There's a bonus at the end - an interview with the author. That's heart wrenching, too, because of the loss of so many of Adam's SEAL team members. Where does Fearless rank among all the audiobooks you?? ?ve listened to so far? What does Paul Michael bring to the story that you wouldn?? ?t experience if you just read the book? A great story about a true American Hero. 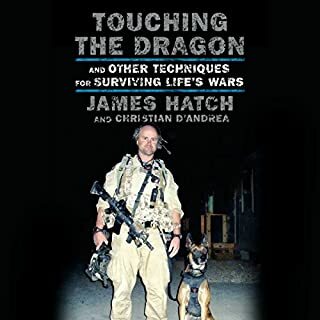 I'm a firefighter and a SWAT Medic and always thought i was pretty tough but am humbled by this story...all the more so because of the times it brought me almost to tears. Every American (including our leaders) should read this book of an amazing man that overcame much to then give his all to his country. Thanks to his family for allowing his story to be told - I thank you for what your husband, father and son did for me and mine.